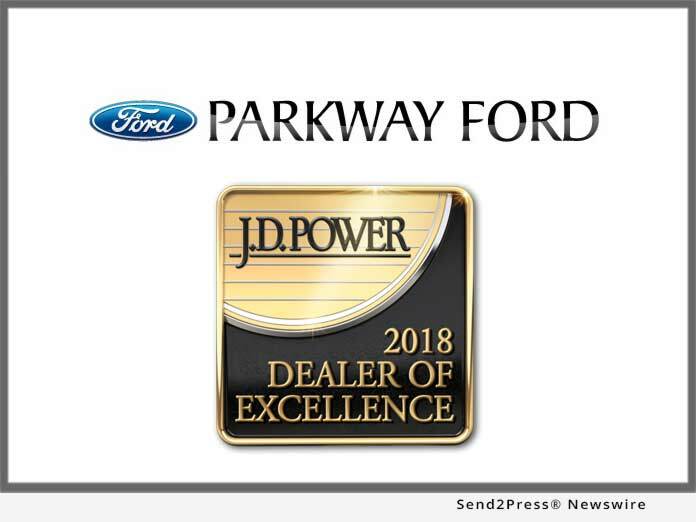 WINSTON-SALEM, N.C., Aug. 28, 2018 (SEND2PRESS NEWSWIRE) — Demonstrating its commitment to exceeding customer expectations, Parkway Ford Lincoln has been certified in the J.D. Power 2018 Dealer of Excellence Program℠ which recognizes a select number of vehicle dealerships throughout the United States that provide exceptional customer service. Known for its “Voice of the Customer” research for 50 years, J.D. Power and, subsequently, its Dealer of Excellence Program help consumers identify leading retailers that will go the extra mile. According to J.D. Power, buying a vehicle is a significant financial transaction and can be stressful because there’s so much information to digest. The Dealer of Excellence Program assists auto buyers who are looking for an exceptional dealership where they can confidently buy a vehicle. Certified dealers also benefit by leveraging the J.D. Power brand and promoting their dealership’s commitment to an outstanding customer purchase experience. As the first qualification criterion, J.D. Power limits the percentage of eligible dealerships by nameplate based on each brand’s performance in the most recent J.D. Power U.S. Sales Satisfaction Index (SSI) Study℠. Thus, proportionally more dealerships from top-performing brands can become a J.D. Power Dealer of Excellence. Second, dealerships must rank among their brand’s top performers in key customer satisfaction areas consistent with measurements found in the SSI Study. Finally, qualifying dealers must pass an audit to show they meet or exceed J.D. Power sales best practices. Those best practices include, but are not limited to, listing vehicle inventory and pricing on the dealership website; negotiating in an efficient and transparent manner; offering a fair trade-in value; and presenting a clear and easy-to-understand menu of finance and insurance products. Parkway Ford Lincoln offers the widest variety of Ford and Lincoln vehicles in Winston-Salem, as well as Greensboro, High Point, Burlington, and Charlotte areas. Along with excellent customer service, “100% Transparent Pricing,” and fifty years of experience, they offer 2 locations, one on Peter’s Creek Parkway and one on University Parkway in Winston-Salem. "As an automotive leader in Ford and Lincoln sales in the Winston-Salem area, we feel honored to receive such an award," said Ched Neal, partner of Parkway Ford Lincoln.